Betty Whittick relives her childhood in Garth Road. 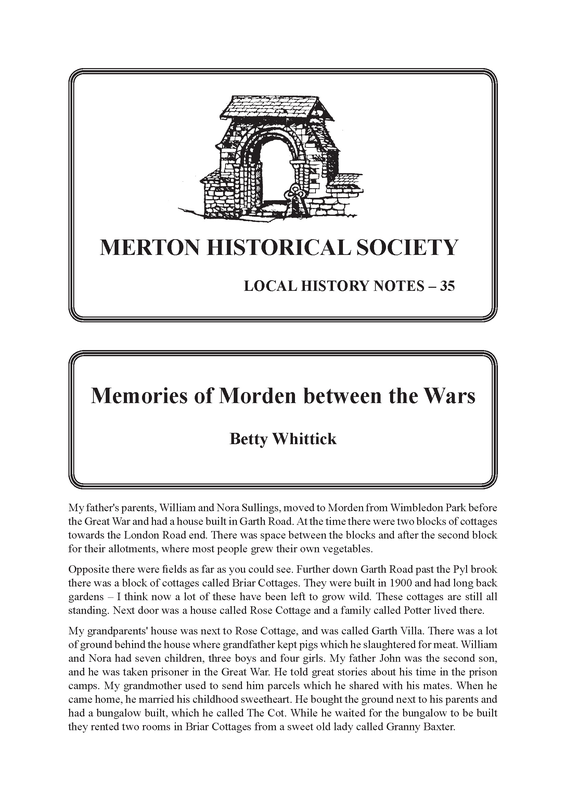 Those who heard Betty at our September ‘Chat Show’, or have listened to snippets on our website, have already had a foretaste of these fascinating reminiscences. for their allotments, where most people grew their own vegetables. standing. Next door was a house called Rose Cottage and a family called Potter lived there. they rented two rooms in Briar Cottages from a sweet old lady called Granny Baxter. My mother and eldest sister at the gate of The Cot, later No. 165 Garth Road. caught scrumping in the orchard you were in trouble. ditches and having a great time; it was safe in those days. amongst the coats in the cloakroom and ate their lunch. wood I started there – it was much nearer. Sainsbury’s or Tesco in those days. us play ball, skip, knit or sew on Sundays. we could go on our way with clean shoes. uncle was that one more. and still live there now. This entry was posted in Publications, Local History Notes and tagged in 20-century Morden, chatshow, lhn, morden, Reminiscences.